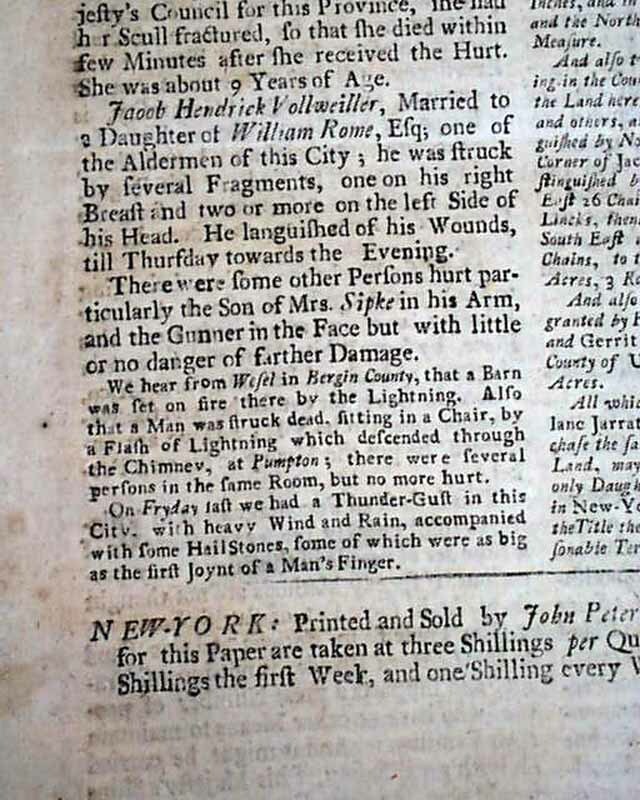 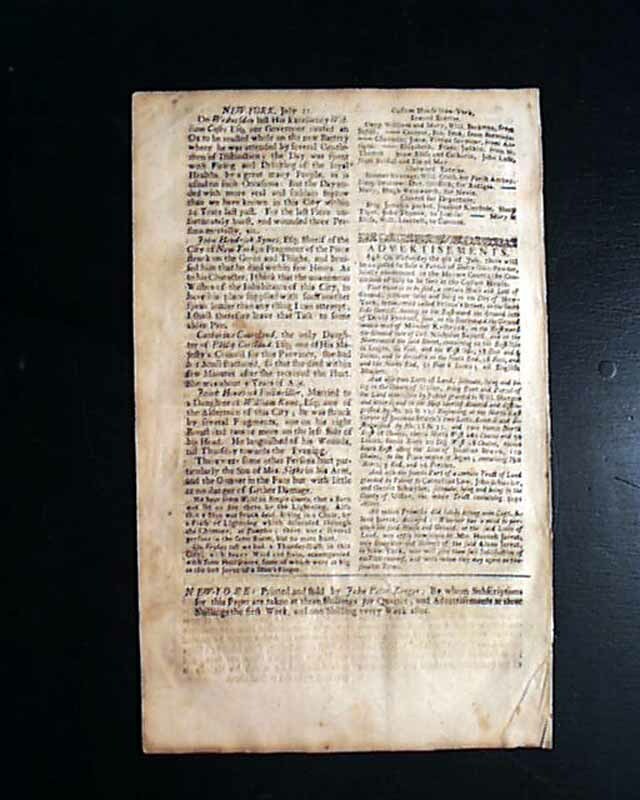 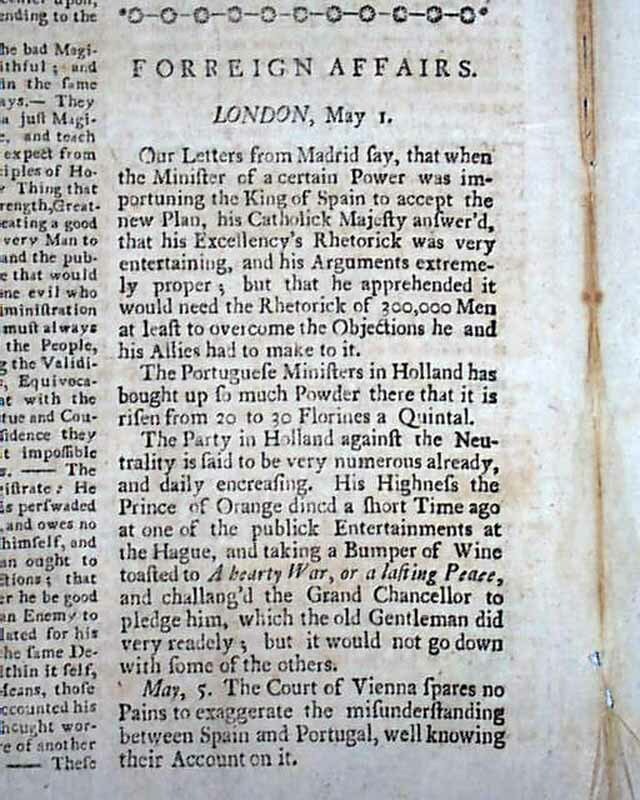 This is the very rare & early newspaper printed by John Peter Zenger who, just 8 months earlier was arrested for the critical comments he made in his newspaper about a decision made by the British Governor of New York, William Cosby. 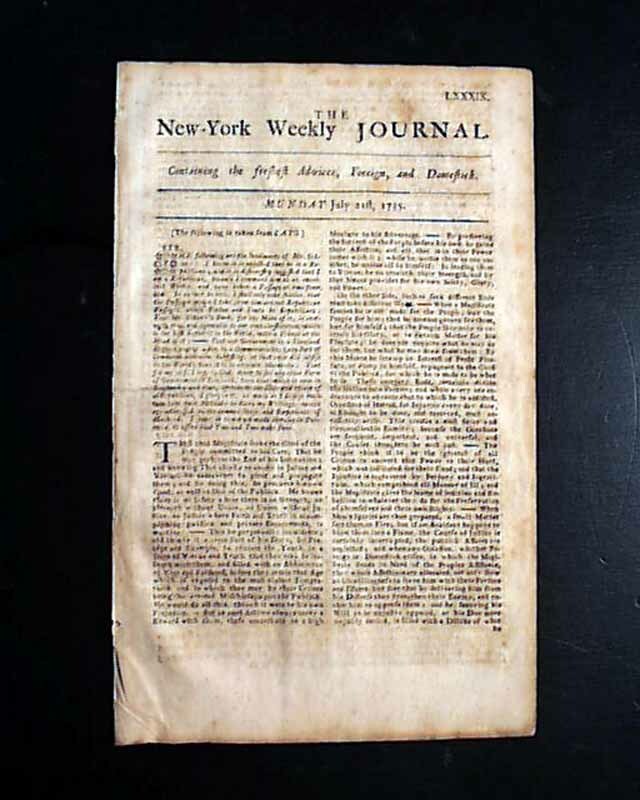 The result was a famous libel case in which Zenger was acquitted, the argument being that he had printed the truth and that truth is not libelous. 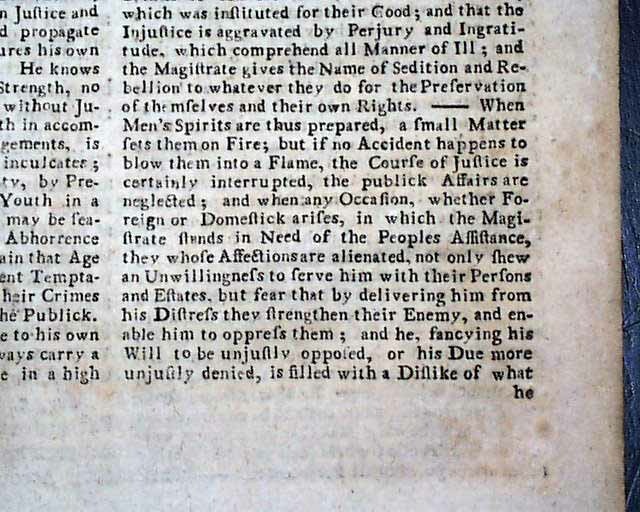 It was--and still is--considered a landmark decision in establishing freedom of the press in America. 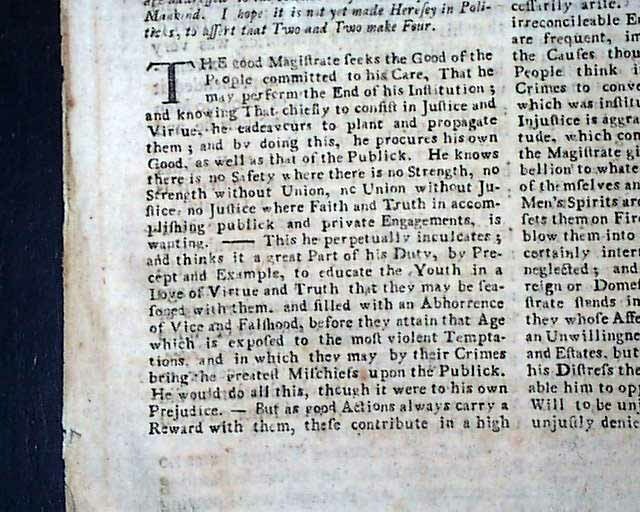 Governor Cosby would soon order that copies of Zenger's "Journal" be: "...burned by the hands of the common hangman...". 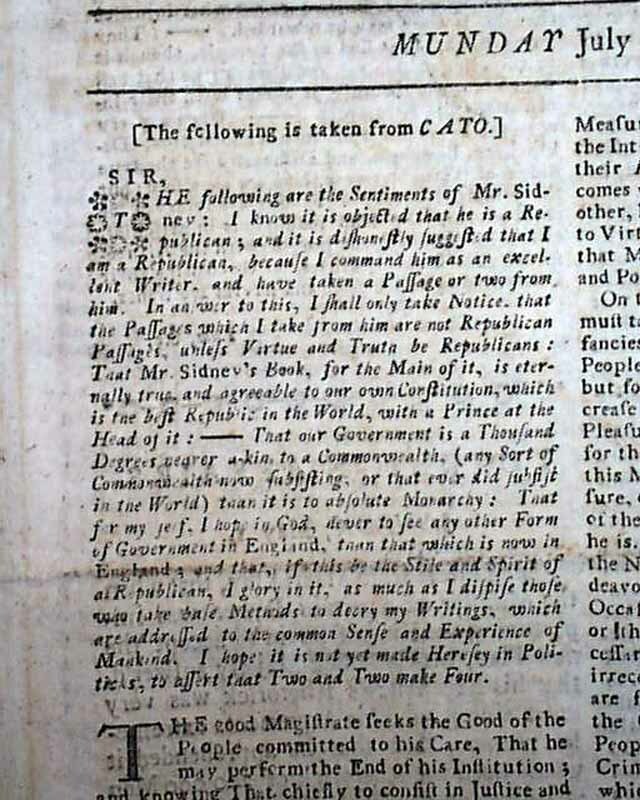 The front page begins with a lengthy letter "...taken from CATO", curious in that Wikipedia cites another letter from "Cato" in an earlier issue of Zenger's newspaper when discussing the famous libel case which Zenger would win (Cato was the pen-name of 2 British writers considered "the leading luminary of the 18th century libertarian press"). 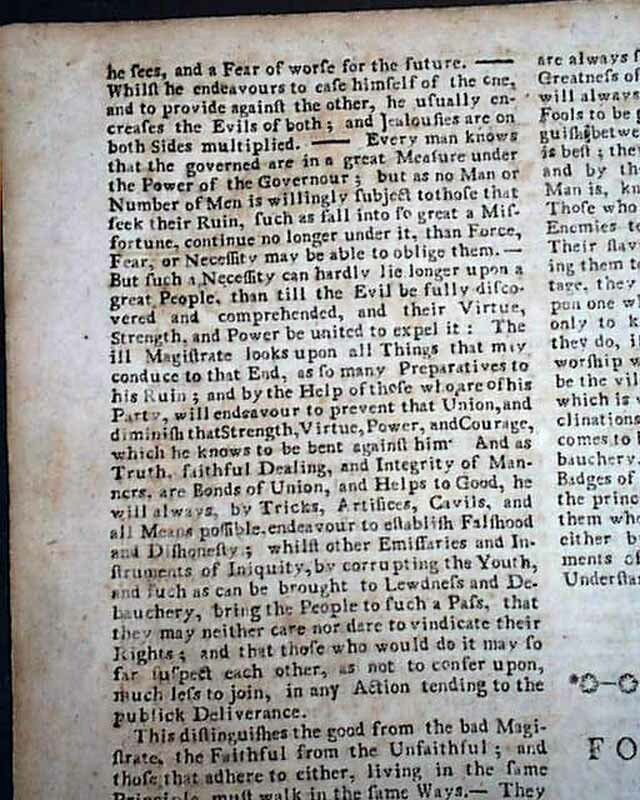 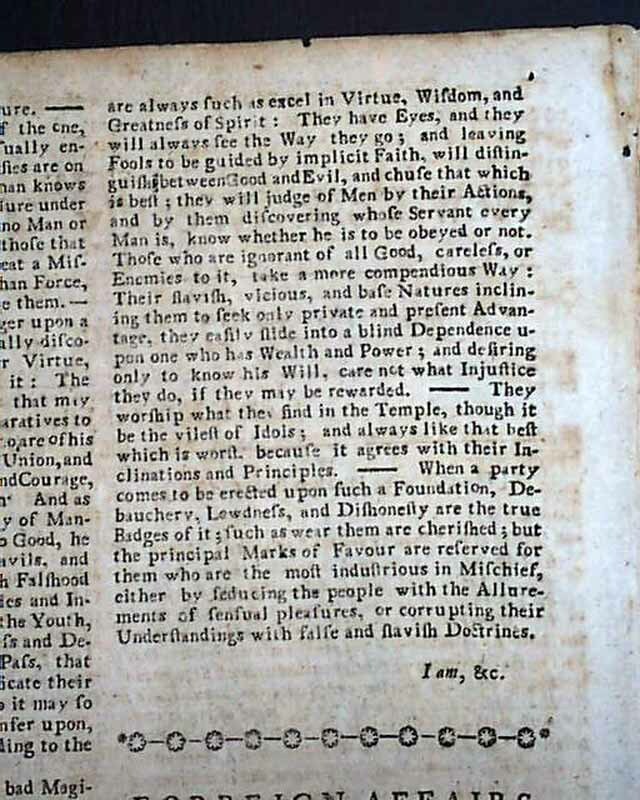 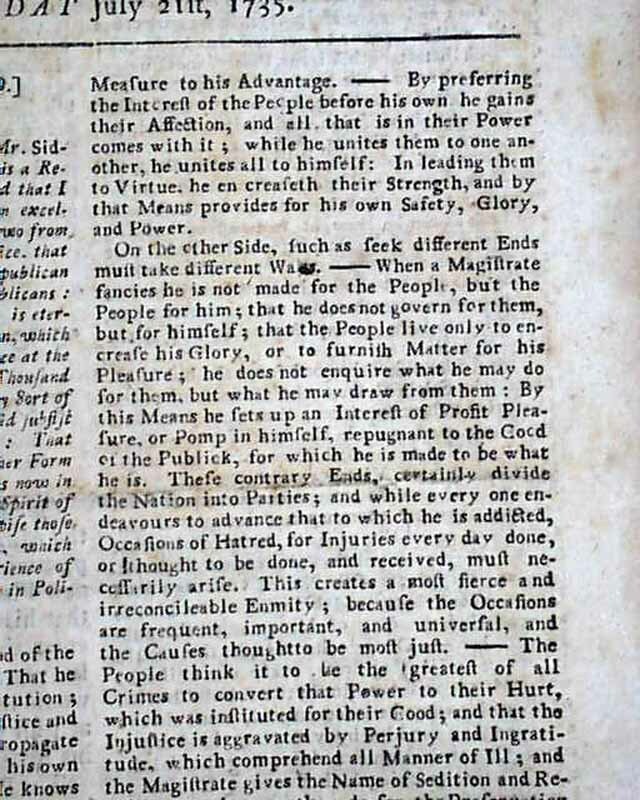 A portion of the Cato letter in this July 21 issue includes: "...When a magistrate fancies he is not made for the people, but the people for him, that he does not govern for them,but for himself; that the people live only to increase his Glory or to furnish matter for his pleasure..." with more. 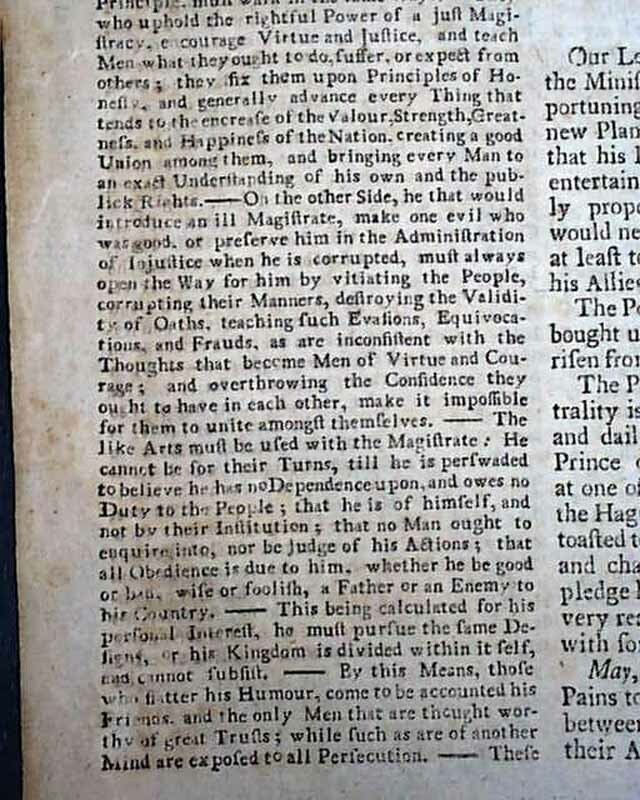 This is likely a not so thinly-veiled reference to Governor Cosby, who had Zenger arrested & later charged with libel. 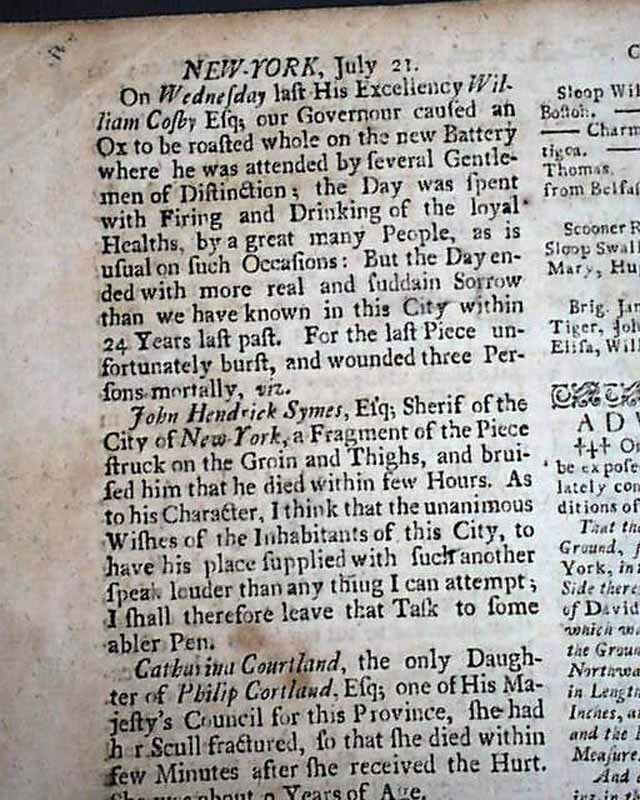 Interesting also that the back page has mention of Cosby by name (rarely appearing as such in Zenger's newspapers), beginning: "On Wednesday last his Excellency William Cosby Esq., our Governour caused an ox to be roasted whole on the new Battery where he was attended...day spent with firing and drinking of the loyal healths by a great many people..." but it would end in tragedy (see). 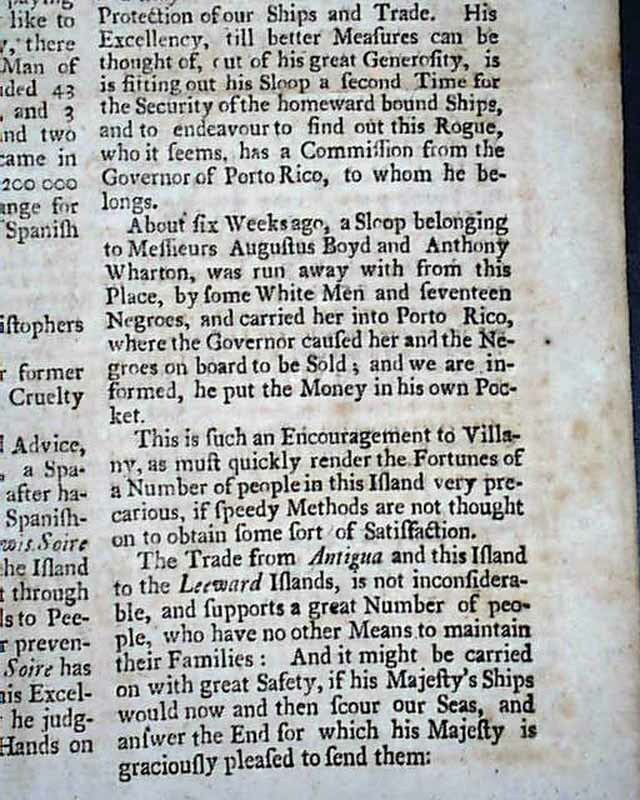 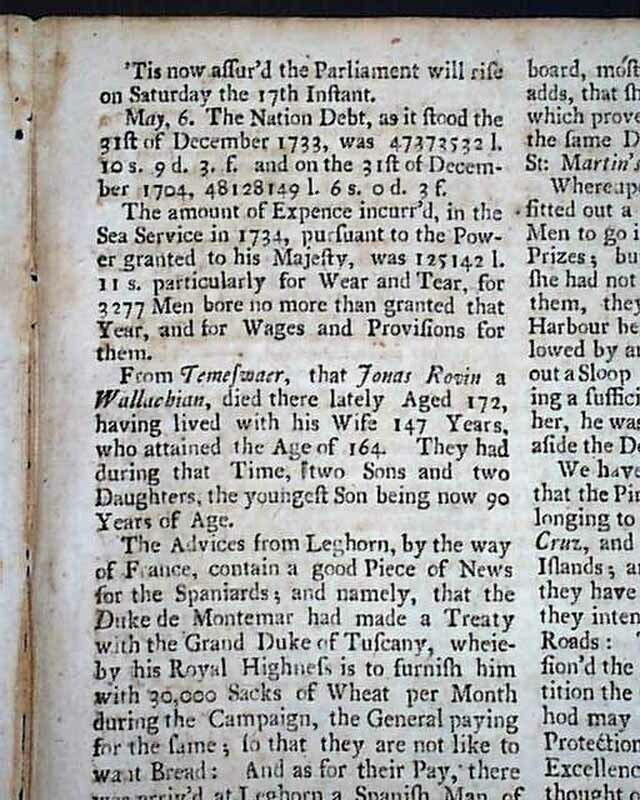 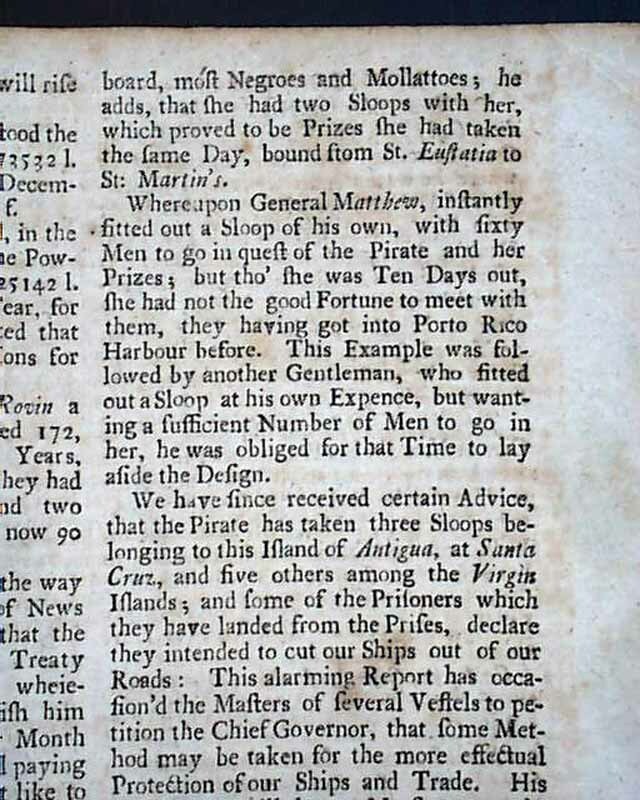 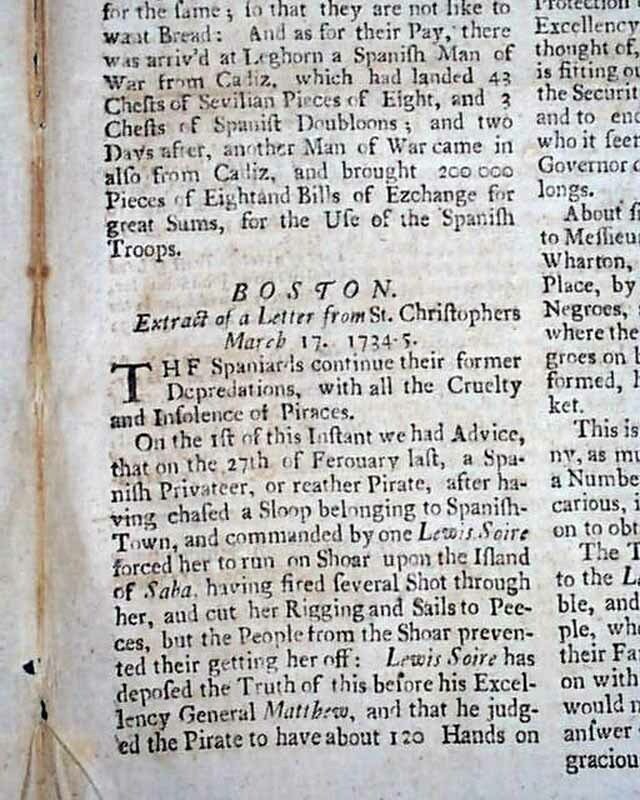 Note also the considerable reporting concerning pirates and slaves aboard ships, more on these topics than is typically found in period newspapers (see). 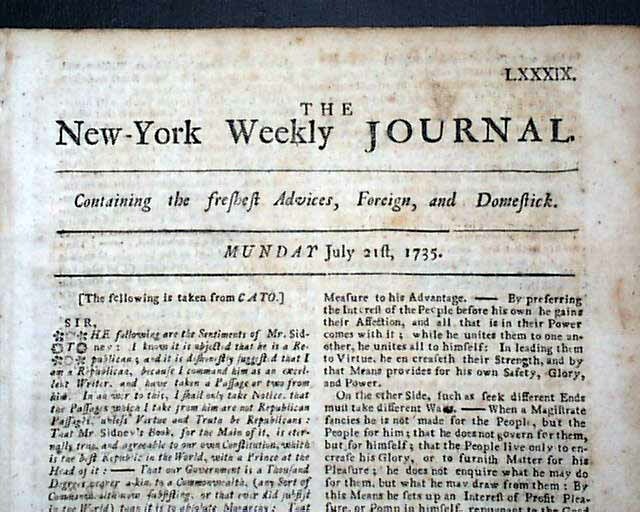 The "Journal" was created to be a voice against the governor (the N.Y. Gazette supported him) and the paper focused on the conduct of Cosby & his actions. 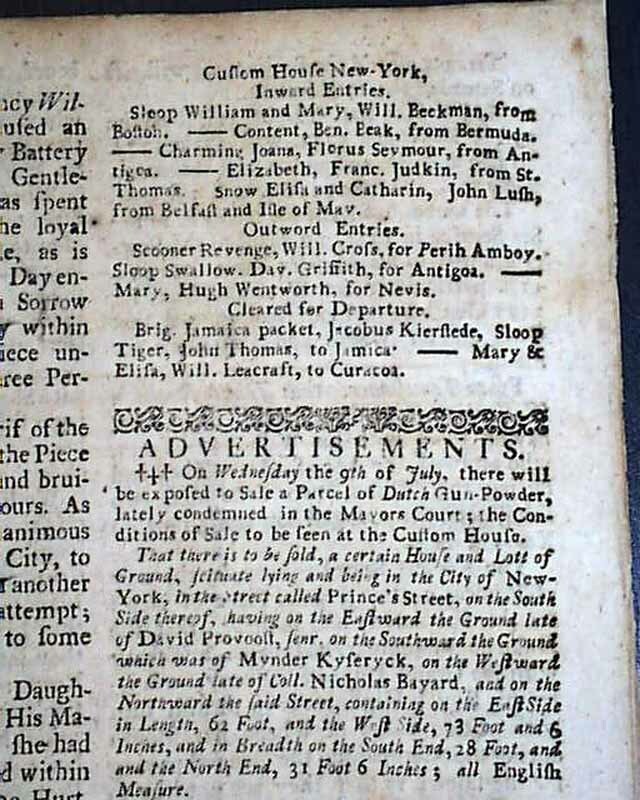 At the bottom of the back page is the imprint noting the newspaper is: "Printed and Sold by John Peter Zenger..." (see). 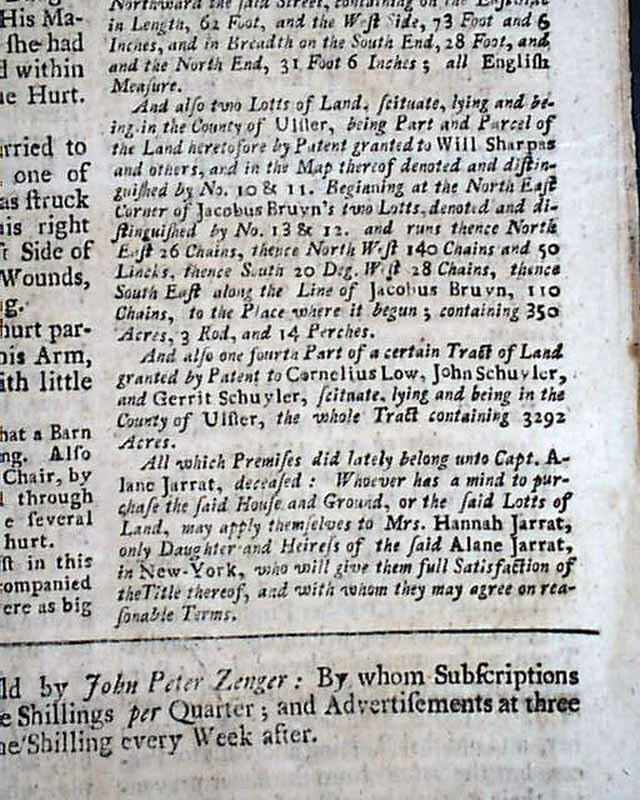 A very rare newspaper plus with some content perhaps relating to the Zenger trial. 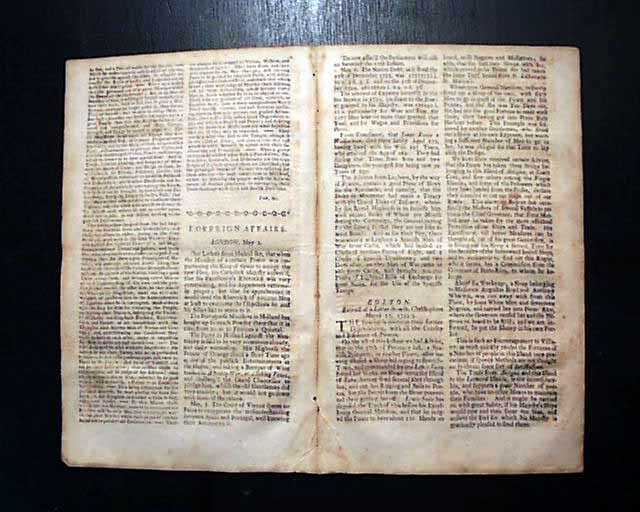 Complete in 4 pages, 7 by 11 inches, very nice condition.